RUSSIAN in 10 minutes a day® is a complete, hands-on language learning experience! Interactive computer Sticky Labels, Flash Cards and special activities add a fun new twist and you'll learn faster than ever! Whether you're exploring St. Petersburg, marveling at the architecture in Moscow, or taking a journey on the Trans-Siberian Railway, all your language needs are covered. This book/software combo has everything you'll need for your adventures in Russia! Designed to look like a child's workbook, the 10 minutes a day® book is an approachable and fun program for everyone. It covers the material equivalent to more than a year of high school Russian or the first quarter of Russian at university. It's a refreshing alternative to boring textbooks and you'll be surprised at how much you learn. Use the book to guide you, step-by-step, through learning and speaking Russian. The Russian alphabet: Use this lesson to learn the Russian alphabet. Write each letter and become familiar with its pronunciation. 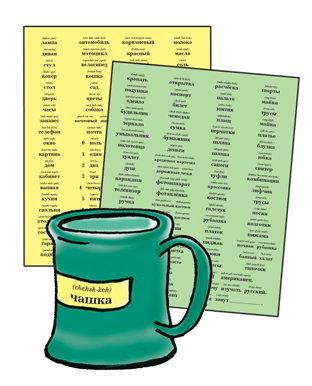 With a little practice, you'll be on your way to reading Russian in the very next lesson. With the Guide and simple phonetics above each Russian word, it's easy to begin speaking Russian with the correct pronunciation. Sounding similar to their English counterparts, these Russian words take no extra effort to add to your vocabulary. You can quickly look up a Russian word, its pronunciation and definition.